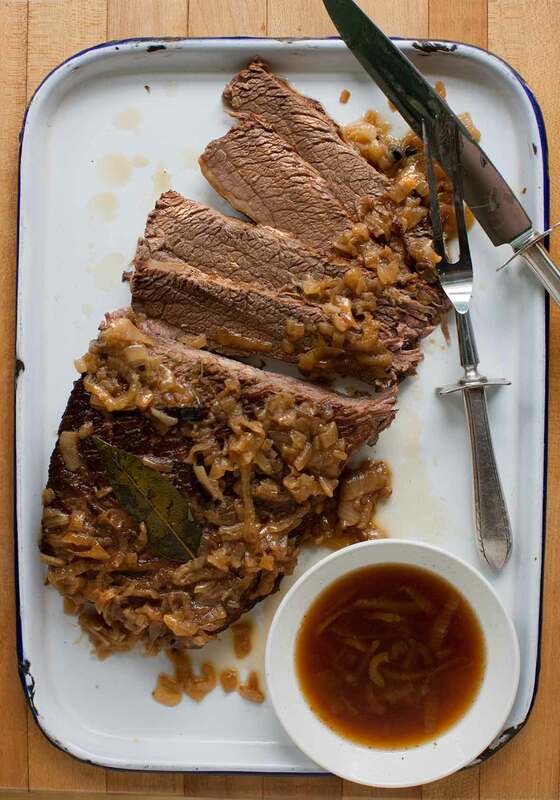 Our Edna Lewis oven brisket recipe is a classic. It’s an eminently affordable Sunday supper made with a bare minimum of ingredients—essentially just brisket, onions, and love. This recipe was originally written entirely in Edna’s inimitably charming, albeit rather spare, style. What we mean is there was a certain amount of knowledge she assumed on the part of the home cook—namely specific temperatures and timings and seasonings. Understandably. Back in her day, cooking was done by instinct, a knowing that came with practice. Anticipating a little confusion in today’s home kitchen, we snuck in a few specifics here and there. Still, there are places that allow for the cook’s discretion. Embrace it. 2. Pat the brisket dry and season it with salt and pepper to taste. Heat a skillet over medium-high heat, slick it with just a little oil, then add the brisket. Sear it well on all sides until well-browned. Place the seared brisket in a heavy ovenproof pot or pan such as a Dutch oven. 3. Wipe the skillet out and then add the butter or oil and onions and return to medium-highish heat. Cook, stirring occasionally, until pretty well browned. Sprinkle the brisket with pepper then add the browned onions, allspice, and bay. Cover tightly and transfer to the oven for about 10 to 15 minutes. Reduce the heat to 225°F (107°C) and let cook undisturbed for 2 1/2 hours. 4. Transfer the brisket to a cutting board to rest. Spoon off any visible fat from surface of the pan juices and discard the bay leaf. Spoon the onions into a sieve or strainer, place it over the pan juices, and press the onions through the sieve, discarding any solids. If desired, strain again and reduce over medium heat for a few minutes. Taste and season the pan juices with salt and pepper to taste. 5. Slice the brisket and serve with the pan juices. Edna Lewis Oven Brisket Recipe © 2006 Edna Lewis. Photo © 2006 Nuno Correia. All rights reserved. All recipes and photos used with permission of the publisher. Hello. I am a film maker in Atlanta. I produced a 21 minute documentary about Edna Lewis and her life, “Fried Chicken and Sweet Potato Pie.” It was a unique pleasure to get to know Miss Lewis in her last years. Great documentary! – thank you very much for preserving Edna Lewis’ story. I saw it and loved it. The ending had me in tears. You captured all of the most important, and even unexpected elements, of her culinary journey. Bravo! Thanks so much for the link, Susan! Thank you. 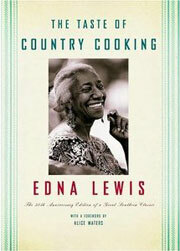 It is a tribute to Edna Lewis that her writing and her recipes continue to inspire people and give them pleasure. In my film I also hope to convey the timelessness of her contribution. How much time should I add for cooking a larger piece of brisket – proportional?? Hi Georgine, how much larger is your brisket?